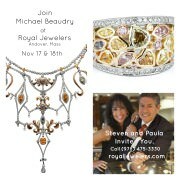 Meet Michael Beaudry in Andover Mass Nov 17th & 18th at Royal Jewelers. Let’s talk jewelry design – one of a kind pieces just for you! want and have Michael work with you to make that dream come true. Or share with Michael some of your desires and let him help you express that into a design to be hand made just for you. Let us know you are coming. Comment below or contact us.